As I prepared to fly halfway across the globe, I sensed a burnt candle. In my heart I believed it was a message from Heaven, from my Dad. My family and I celebrated Dad's birthdate here on earth by doing what my Dad loved to do: make my Mom smile, take her to new places surrounded by flowers and marvel on the beauty of nature. Persistence (yes, never give up), believe in God, and family first - those were values Dad taught us, his priceless legacy. In my almost 52 years of existence, my recent trip to the Philippines was the first ever Mom-and-Daughter duo adventure. Each day I said my gratitude because I felt truly blessed to have a very supportive husband and family. 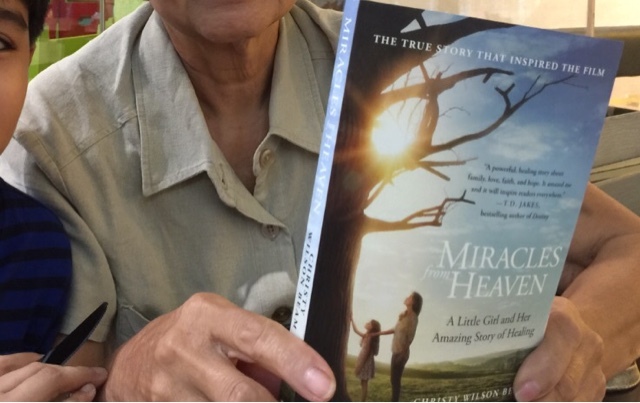 One of last unplanned souldeep adventure my Mom and I did was to watch, "Miracles from Heaven". I had seen the movie's trailer last year and added it to my wish list. In fact, I scheduled to watch it with my dear friend when I get back home. "Miracles from Heaven" is major tear-jerker movie about family, faith and miracles. My family had been through a lot of challenges and I had questioned God at times, so it was no surprise that I cried from beginning until the end even though I had already read the book. Watching the movie was in itself a miracle. It strengthened my faith (thank you Anna Beam) and reminded me to not give up. When we got home that day, she already read the first chapter, and I noticed my nephew was reading it, too. There are quite a few things on my wish list but there's one closest to my heart. For my family to be together again and I believe that this year will be another year of miracles.